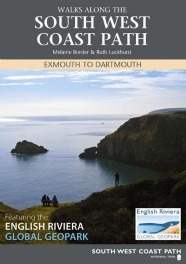 Walks along the South West Coast Path, Exmouth to Dartmouth, Featuring the English Riviera Global Geopark: by Melanie Border and Ruth Luckhurst. This beautifully illustrated 64-page full colour guide has fantastic aerial photography to map each route. It provide an essential guide to exploring the local area on foot and includes full route descriptions along with highlights of some fascinating features to look out for along the way. All walks take up to half a day or less to complete and most are circular with suggestions about where to stop for a pub lunch or a true Devonshire cream tea. Available from the Geopark Visitor Centres, Tourist Information Centres and online. 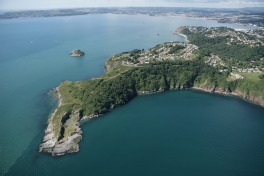 Watch this space, Hopes Nose, Saltern Cove, Babbacombe, Berry Head and Paignton Built Heritage...coming soon! 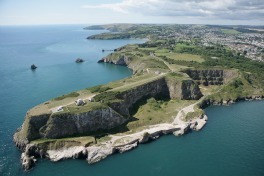 Berry Head Audio Trail: To help you get the most out of your visit to Berry Head you can follow the Audio Trail and collect rubbings using one of the site 'Spotter Guides' available from the Guardhouse Visitor Centre. There are 15 points on the Audio Trail which take you on a journey from the tip of the headland right around the site. You can choose either the Children's Trail, or the Adult Trail. A site leaflet, available at the Guardhouse Visitor Centre, contains a map showing all the rubbing plaque locations and the audio stop points. The audio trail is available with a smart phone from the Visitor Centre at Berry Head (please check winter opening hours before your visit 01803 520022). Once in the centre smart phones will pick up a Bluetooth connection which you will need to log onto. Then away you go. 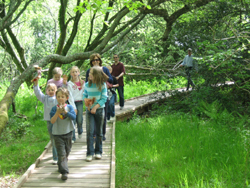 Occombe Farm Audio Trail: The Occombe Farm Nature Trail runs for 2km meandering through the woodland SSSI at the heart of the farm. To guide you along your way we have an Audio-trail commentary, delivered through special handsets available from the Farm Shop. The handsets are free to use, with a £5 deposit. For more information click here. Saltern Cove - A guide to its wildlife and geology: From ancient seas to modern rock pools... come on a 400 million year journey in just a couple of hours. See mountains rise and fall, escape drowning in flash floods, bake in scorching deserts then cool down - if you dare - in a rock pool where its eat or be eaten. This leaflet is available from Tourist Information Centres, The Seashore Centre and Berry Head National Nature Reserve Visitor Centre. Discover Devon Geology: The booklet is available from all good Tourist Information Centres and can also be requested from the Discover Devon web site. www.discoverdevon.com. Agatha Christie Mile: The world's most famous mystery and crime writer was born in Torquay and lived much of her life in the area. 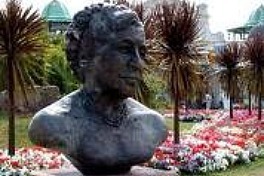 This trail takes in 10 Agatha Christie landmarks scattered around Torquay Harbour and Seafront. The walk is reasonably flat (apart from one hill) and there are mysteries to solve along the way as you enjoy some great views. Pick up the Agatha Christie MIle leaflet form Torquay Tourist Information Centre, Torquay Harbour, where the walk starts. 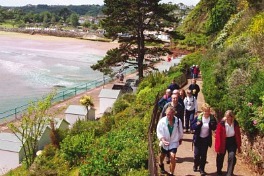 Torbay Heritage Trail and Tourist Guide. The 49 blue plaques across the English Riviera are a great way to discover its heritage. Famous authors include Flora Thompson, author of the Lark Rise books, and Charles Kingsley, who penned the Water Babies. Rudyard Kipling spent two years at Rock House in Torquay, and poet Elizabeth Barrett Browning spent time at the now Hotel Regina on Torquay harbourside. Charles Kingsley author of the "Water Babies" stayed at the Coombe Court Hotel in Babbacombe One of the country’s best loved and most popular hymns Abide With Me was written at the Berry Head Hotel in Brixham by the Rev Henry Lyte, and Hesketh Crescent in Torquay was once leased to Charles Darwin. Engineer Isambard Kingdom Brunel has a long association with the area and scientist Oliver Heaviside, renowned for his work in the field of electromagnetic theory, is recognised in Paignton. Paignton was also the home of sewing machine magnate Isaac Singer, at Oldway Mansion. Wherever you go on the English Riviera, you’ll find plaques that recognise some of the greatest figures in British history. The guide is available from the Tourist Information Centre,Vaughan Parade, Torquay. 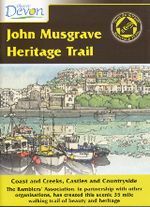 John Musgrave Heritage Trail - Coasts and Creeks, Castles and Countryside. The John Musgrave Heritage Trail is a 35 mile walking route slpit into four sections. The guide book, available from the Tourist Information Centre (Vaughan Parade, Torquay) provides a detailed commentary of local heirtage, maps of the trail, directional text, useful information and transport links.